From 1930 until Abraham Arnold’s arrival in 1949, there was a new editor and/or publisher of the Jewish Western Bulletin every couple of years. Arnold lasted 11 years, Sam and Mona Kaplan about 36 all told. My first article ran in the JWB on March 28, 1997. I was listed as a contributor for the next year, becoming editorial assistant in May 1998, and assistant publisher that September. When Kyle Berger, Pat Johnson and I bought the paper, they graciously agreed that I become the publisher. Since that first issue, June 4, 1999, I have held that title. That makes 16 years. The second-longest term in the paper’s history. For more than 10 years, I’ve been the sole owner of the Bulletin / Independent. While Kyle still contributes occasional articles and blogs, Pat is on the editorial board with former editor Basya Laye and me, and contributes weekly. I have worked with countless talented and kind people, many of whom have stuck with me, the paper and the community through some tough times, especially since the 2008 economic downturn. It is us, a handful of people, along with a few regular freelance writers, who get this paper to press every week. It is a labor of love for all of us. We do it for very little pay. Financial struggle is as much a characteristic of this paper as is its Jewish character and its communal foundation, though that is one tradition I would happily leave to the dustbin of history. Reviewing the 85-year history of the paper affirms my conviction that it is an absolute treasure, one of immeasurable value to Jewish life and this community. Yet, it is largely taken for granted. True, it has its admirers – thank you to all the organizations and businesses who advertise, and to all the readers who subscribe, donate or support our advertisers. But, on the whole, it is undervalued. And it has been almost since Day 1. The newspaper got its start in 1928 as a mimeographed newsletter whose goal was to generate the funds and enthusiasm for a Jewish community centre. It succeeded in that regard, though the JCC would experience existential difficulties more than once in its life. Today, thankfully, the JCC is a strong and vibrant fixture in the community. When the mimeo became a tabloid in October 1930, its name was borrowed from a 1925 publication that was well-loved but, evidently, not well-funded, as it didn’t last for long. More than one editor of the JWB has exhorted readers to pay their subscriptions and pleaded with organizations to buy advertisements. The relationship between editors and readers was much more contentious and frank during the 1930s and 1940s than it has been since. Reading these editorials every time I organize a special anniversary issue – this is my fourth – I am both saddened and heartened by the fact that, at their core, the issues remain the same. This year, I have been particularly affected by the missives of editor and publisher Goodman Florence as he neared what turned out to be his last several months with the JWB. In the latter half of 1948, he starts to air some of the dirty laundry that has obviously been accumulating between himself and the Vancouver Jewish Administrative Council that took over control of the paper when the Jewish Community Centre, Jewish Community Chest and Hebrew Aid Society formed it in 1932, as well as other community organizations and even readers. In August, he tackles head on the idea that readers have somehow gotten that “the Bulletin is a highly profitable proposition and is fought for. Such is not the case.” He points out that “subscriptions pay for only postage, paper and addressing, if it does that much. An attractive, newsy and acceptable publicity medium such as the Bulletin, is expensive to produce and its cost must be borne by advertisers.” This remains the case today. After talking about an increase in the price of subscriptions and new help in finding advertisers, Florence concludes, “For 1949 I hope with your cooperation to make of our paper ‘one of the best’ – and to help build a progressive integrated community – and to spread the story of its good works throughout the land. Less than a month later, his farewell editorial was published by the new team at the helm. “Readers want world news, features, editorials . . . officers of all local organizations want their activities to be publicized. Up to date, I have not yet been able to completely sell the simple fact that to do all this requires considerable revenue,” Florence writes. “Some headway has been made in recent months, and there are now signs that more organizations are becoming aware of the need to place advertising that would be considered commensurate with the amount of news publicity their various activities require. There are signs also that more of the Jewish business men are coming to realize that there is after all some virtue in advertising in the Bulletin and doing business with the members of this growing Jewish Community. When I look at the state of the publishing and newspaper industry today, I take heart that there have always been challenges and, despite the often-dire-sounding editorials of Florence and many of the paper’s other editors and publishers, here we are today. Many recessions have come and gone. Heck, the newspaper survived the Great Depression. Will it survive the internet? I certainly hope so, and not just because I would like to own a successful business. 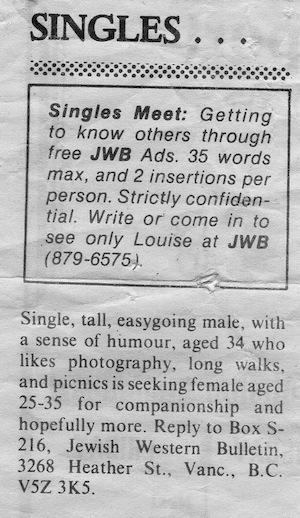 I have looked through the physical pages of almost every JWB and searched through them online (multiculturalcanada.ca/jwb) ad nauseam for various people and events. I have read every single copy of the JI. Every time I look back at the articles and images in the papers, something surprises me, something sparks my imagination, something makes me think or makes me laugh. I don’t know anyone who owns a community newspaper or any similar business. When I read that other editors, publishers and owners of the paper have had similar concerns, challenges and joys, there is a sense of solidarity, of not being alone. When I read about what various people in this community have had to endure, what they’ve accomplished, I am inspired. When I attended the rededication of the Jewish section of Mountain View Cemetery earlier this month, I felt like I had personally known many of those buried there. My connection to this community through its newspaper of record for 85-plus years is that strong and goes back that far. But, ultimately, I didn’t know any of those people. I was born in Moncton and grew up in Winnipeg. My immediate family now lives in the Montreal-Ottawa-Toronto corridor and I came to Vancouver from Ottawa in 1992. My Winnipeg-based aunt had lived here in the 1960s. After I got my MA and a job – i.e. once it looked like I was staying awhile – she connected me with the Vancouver Jewish Folk Choir via her longtime friend and former musical colleague Claire Klein Osipov. It was one of my first connections to the Jewish community here and it has, obviously, led to other connections, including being the editor of the Jewish Museum and Archives of British Columbia’s annual journal The Scribe for the last seven editions. I’ve always liked history, and I love having 85-plus years’ worth of it at my fingertips. It wasn’t until this special issue though that I decided to do a search for my aunt’s name – she passed away last fall. My searches yielded more than a dozen results from 1962 through 1966, including the birth announcement of one of my cousins, her third son. And there was a photo of her, which was published twice, once with the wrong caption, a correction being noted in the following week’s paper. I knew that Aunt Chickie (married to Nathan Frankel at that time) was involved in the Peretz Centre and that she accompanied Claire on the piano, but seeing some of the committees she was on, the events she helped organize, the music she performed … seeing her face – I can’t describe the feeling, except to say, once again, this newspaper is such a vital resource in ways that I’m still discovering after almost 20 years working here. S.A. Goldston, in the JWB. He wonders whether the Bulletin had “filled the mission for which it was first intended? Is it any use today?” He leaves the answer to readers, “for naturally we are somewhat prejudiced in our personal views on the matter. Goldston and his colleagues have “the great ambition of doubling the size of the paper,” which was then eight pages, within the next year. He asks for help in getting there, saying he has “much to be thankful for,” despite his “failing health,” and is proud to hold the position of editor. The very next issue carried a front-page obituary. Goldston had passed away suddenly, at age 63. According to B.C. Archives records, he died April 11, 1934. His given names were Sim Alfred. David Rome, in the JWB. In the 1935 editorial marking “Five years of the Bulletin,” editor David Rome echoes some of Goldston’s remarks. He, too, speaks of gratitude and writes that the Bulletin’s “being taken as a matter of course by Western Canadian Jewry” is “the greatest compliment that can be offered to it,” showing that it “is not a freak venture but part of the life of its readers. Somehow I feel that, with every issue of this paper, we are honoring the people in this community who have made – and are making – sacrifices for whatever people and causes that are important to them. Every event, interview, photo, birth announcement, obituary … everything that gets recorded is proof of existence, of purpose, of being part of something larger than oneself. This newspaper has always had a grand, even grandiose, view of the impact it could have on the community. But, looking back at 85 years – 90 if you count the original Bulletin, 87 if you start at Grossman’s mimeo – I’d say it has exceeded even the grandest of its expectations. And I’d like to see it continue to do so, whether or not I’m involved. But, as pretty much every publisher of the paper will tell you, “There are two things apart from the reading matter that is necessary to make a paper a success….” The future of this community treasure is, quite literally, in your hands. The community has always enjoyed a good contest, JWB, December 1948. Hebrew University, Talmud Torah, Histadrut, summer camps, and the full range of communal organizations and causes, many of which continue to thrive today. Individuals are fêted for service to the community, for becoming bar or bat mitzvah, for graduating from university. Of course, some headlines are unique. On Nov. 3, 1988, the paper’s headline blared: “Israel achieves UN victory.” This was about a failed attempt led by Arab states to have Israel thrown out of the General Assembly. Philanthropy is a continuous thread joining the decades. As early as 1930, the editorial was acknowledging that “The residents of the Vancouver Jewish Community doubtlessly at times become impatient with the term, ‘A worthy cause’” … before inveigling upon readers to support another commendable undertaking. Pressure, sometimes not at all subtle, urged readers to give generously to the community chest campaign. “Larger Pledges Needed for Success of Chest,” the headline of October 9, 1936 read. “Open Your Door to Your UJA Canvasser,” pitched an issue in 1951. Running in 1930, this headline nevertheless could have been from any decade in the paper’s history: “Bronfman Family Create Scholarship.” In this case, it was for the Talmud Torah and a Jewish orphanage in Winnipeg, but more than half a century later, the Bronfman family was instrumental in the creation of the Birthright-Israel program, which has sent thousands of young Jewish Canadians to Israel. The paper routinely stressed the community’s loyalty to the Crown, JWB, May 1939. King George VI and Queen Elizabeth are pictured here. In decades when Jewish allegiance to Canada was sometimes implied or openly expressed, the paper routinely adopted a highly patriotic tone. From heralding King George VI to lamenting his death with pages of editorial, there were also major assertions of Jewish allegiance to the new Queen Elizabeth II at the time of her coronation in 1953. Meetings of Jewish communal officials with elected leaders, including prime ministers, have been prominently reported, including just weeks ago when Prime Minister Stephen Harper met with Sephardi Canadians in Ottawa. Although allegiance to Canada has been conspicuous, so too has been this community’s deep connections to the Jewish homeland. Throughout the 1920s and 1930s, anti-Jewish riots and pogroms in Palestine killed hundreds and shattered hopes of a peaceful existence in the Yishuv. These riots had the intended consequence of leading the British authorities to end Jewish migration to the Mandate. While met with outrage and agitation by Jews worldwide, the catastrophic historical impact of that decision would not be fully recognized until the endangered Jews of Europe suffered the Holocaust. Jews and Christians packed Vancouver Lyric Theatre to overflowing after news of Kristallnacht signified what we now understand to have been the unquestioned beginning of the Holocaust. By 1944, the realization of what had happened to European Jews was widely understood and an above-the-banner editorial held no punches: “To anyone working for one Jewish cause or another it becomes increasingly apparent that there are those among us who are SHIRKING THEIR DUTIES AND RESPONSIBILITIES. “Yes, there are those among us who are too busy with their own affairs to think of their fellow man. “Many of our fellow Jews never care to remember that somewhere in the darkness of Hitler’s Europe thousands and thousands of men and women and children are hiding in basements, in walled ghettos and in dismal forests in an attempt to escape certain death, while we abide in the glorious freedom and abundance of Canada. “At this moment half the Jews in Europe are dead. WHAT IN GOD’S NAME WAS THEIR CRIME? “You know, and I know, that their only crime is that THEY WERE BORN AS JEWS. When the war ended and the camps were liberated, the local community came together, helping in different ways, special prayer services among them. From 1945, the issue of Soviet Jewry made top news month after month until 1989, when a new revolution allowed Jews across Eastern Europe to emigrate, changing the face of Israel and Vancouver, among other places. The paper has also highlighted the achievements of Jews around the world, from the first Jewish governor of Oregon to the appointment of a Jewish American ambassador to Albania. 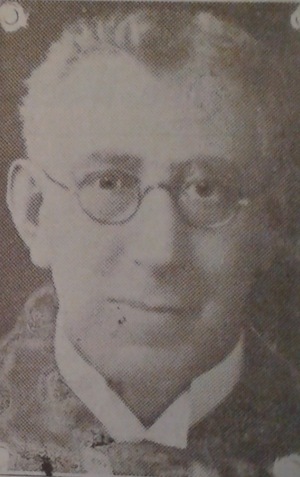 In 1930, the paper hyperbolically declared: “Of interest to every Jew in Canada is the recent election of David Arnold Croll, 30-year-old Jewish barrister as Mayor of Windsor, Ontario.” This item may not have had the universal interest the author believed, but Croll did go on to serve in the Ontario and Canadian parliaments and became the first Jewish senator in Canada. Since its beginning, the paper has been reporting on community-held contests of various sorts, including photo and public-speaking competitions – the latter still held annually despite worries as early as 1966 that, “These days when the custom of watching television has caused sociologists concern over the possibility of mankind forever losing the art of conversation …” began one editorial. The 2014 Jewish Federation annual campaign has closed with a record achievement of $8 million, which is an increase of $290,000 from last year. Funds will support critical programs and services on which thousands of community members rely. One of the keys to success was a fund that saw donors’ new and increased gifts doubled through a matching gifts program supported by several major donors. This helped inspire many donors to make first-time gifts to the campaign or to increase their gifts, and helped the campaign reach its record. Jewish Federation was named a top 20 charity in British Columbia by the Vancouver Sun in 2012 – the most recent rankings to date – and scored particularly well with respect to its low administrative and fundraising costs. Canada Revenue Agency guidelines indicate the cost of fundraising should be below 35%, but Jewish Federation’s is below this with a net cost of fundraising for the 2014 annual campaign of 12.5%. Federation has been around longer than most of us, and the JWB/JI has been reporting on its activities from the very beginning. 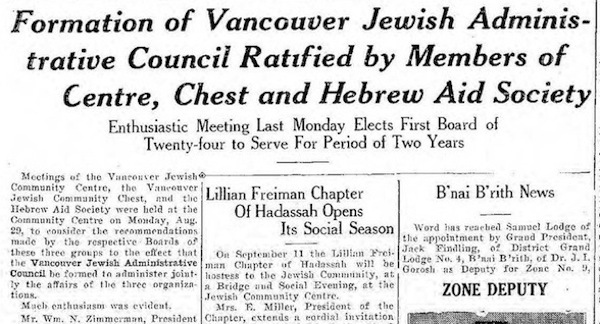 The Sept. 1, 1932, JWB reports on the creation of the “Formation of Vancouver Jewish Administrative Council Ratified by Members of Centre, Chest and Hebrew Aid Society.” The subheading reads, “Enthusiastic Meeting Last Monday Elects First Board of Twenty-four to Serve For Period of Two Years.” A year later, in July 1933, the JWB reported, “Formation of an Endorsation Bureau Unanimously Endorsed.” The full text of both articles follows. Meetings of the Vancouver Jewish Community Centre, the Vancouver Jewish Community Chest, and the Hebrew Aid Society were held at the Community Centre on Monday, Aug. 29, to consider the recommendations made by the respective Boards of these three groups to the effect that the Vancouver Jewish Administrative Council be formed to administer jointly the affairs of the three organizations. Upon motion by Dr. S. Petersky, and seconded by L. Gorosh, the members of the Vancouver Jewish Community Centre ratified the recommendation of their Board of Governors, and approved the formation of the Vancouver Jewish Administrative Council. Following this motion, the meeting of the Jewish Community Centre adjourned, and the Vancouver Jewish Community Chest meeting was called to order. In the absence of Mrs. M. Koenigsberg. President of the Vancouver Jewish Community Chest, Mr. Wm. N. Zimmerman was requested to preside at the Chest meeting. After considerable discussion by members of the Chest, regarding the proposed amalgamation of administration, and after the Constitution of the Administrative Council was read by Mr. E.R. Sugarman, it was unanimously resolved by the Chest members “That the Vancouver Jewish Administrative Council be formed to jointly administer the affairs of the Vancouver Jewish Community Centre, the Vancouver Jewish Community Chest, and the Hebrew Aid Society.” The Chest meeting then adjourned. Following the motion, the meeting of the Hebrew Aid Society was adjourned, and Mr. W.J. Levin, acting chairman of the Vancouver Jewish Administrative Council, presided. Mr. E.R. Sugarman moved that the constitution as read be adopted for the Vancouver Jewish Administrative Council. This motion was seconded by Dr. Petersky, and carried. The Chairman explained that under the Constitution as adopted, a Board of 24 must be elected and that the sub-committee working out plans for the formation of the Vancouver Jewish Administrative Council have nominated 21 names for election. To this list could be added nominees from the floor. The enthusiasm of the meeting was so great that thirty names were nominated, and those elected to the first Board of the Vancouver Jewish Administrative Council are as follows: M.H. Brotman, Sam Chess, Mrs. Nellie GeShaye, E.M. Goldsmith, L. Gorosh, M.L. Greene, A.G. Hirschberg, Mrs. H.B. Kalin, I.J. Klein, A.O. Koch, Mrs. M. Koenigsberg, J.L. Kostman, J.J. Lechtzier, P. Lesser, N.C. Levin, W.J. Levin, Mrs. H.A. Nemetz, J. Reed, H. Rosenbaum, S. Rothstein, I. Stein, E.R. Sugarman, Wm. N. Zimmerman and H.B. Kahn. 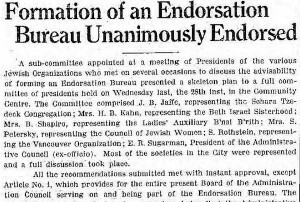 A sub-committee appointed at a meeting of Presidents of the various Jewish Organizations who met on several occasions to discuss the advisability of forming an Endorsation Bureau presented a skeleton plan to a full committee of presidents held on Wednesday last, the 28th inst, in the Community Centre, The Committee comprised J.B. Jaffe, representing the Schara Tzedeck Congregation; Mrs. H.B. Kahn, representing the Beth Israel Sisterhood; Mrs. B. Shapiro, representing the Ladies’ Auxiliary B’nai B’rith; Mrs. S. Petersky, representing the Council of Jewish Women; S. Rothstein, representing the Vancouver Organization; E.R. 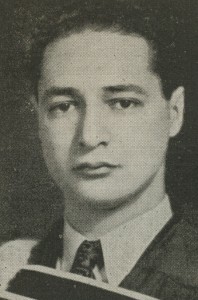 Sugarman, President of the Administrative Council (ex-officio). Most of the societies in the City were represented and a full discussion took place. All the recommendations submitted met with instant approval, except Article No. 1, which provides for the entire present Board of the Administration Council serving on and being part of the Endorsation Bureau. The principal argument against such a procedure being that the Administrative Council was elected for the specific purpose of administering the affairs of the Hebrew Aid, The Jewish Community Centre and the Community Chest, and with a representation of twenty-four members they would have increased powers for which their constitution did not provide, and which would enable them if they so desired to veto any project brought before them by the increased new representatives. The Chairman, Mr. E.R. Sugarman, explaining that by virtue of the newly formed organization each new member elected would have a seat of the Administrative Board and become part and parcel of the Board. If it were, however, necessary he felt that the Board though elected for two years (of which they had only served one) would be willing to resign en masse and that a new election could take place and such alterations as were necessary would be made in the Constitution of the Administrative Council at a meeting of Contributors specially called for that purpose. This explanation seemed to allay the objections raised and on a vote being taken every representative present voted unanimously [in] its favor. It was further arranged that the plan be submitted to a mass meeting on Sunday, July 30, at which meeting the delegates of the Western Conference in Winnipeg would be present and submit their report. 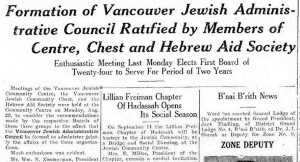 That the existing organization, known as the Vancouver Jewish Administrative Council, be enlarged to include the Presidents of fifteen organizations, a list of which we hereby append, and this newly constituted body have the powers heretofore existing in the Administrative Council and be further clothed with the power to supervise and endorse all matters or projects of a community nature whether the same be initiated by organizations or groups of individuals. That the said body further be considered in the position of speaking on behalf of the whole Jewish Community of Vancouver, particularly in matters which are submitted to the Community to act as a unit. The right to supervise or interfere with the private management of any organization shall be specifically eliminated. That endeavours be made immediately to consolidate the Junior Organizations into a Council of their own and when so consolidated the Juniors to have not more than two representatives on the new Board. That a mass meeting of the citizens of Vancouver be called immediately for the purpose of submitting this new proposition to the Community and have its endorsation of this plan. The list of organizations referred to is as follows: Samuel Lodge B’nai B’rith, Zionist Organization, Ladies’ Auxiliary B’nai B’rith, Hadassah Organization, Council of Jewish Women, The Schara Tzedeck Organization, Beth Israel Congregation, Community Talmud Torah, Cemetery Board, Ladies’ Auxiliary Talmud Torah, Pioneer Women’s Society, Achudth Society, Poalie Zion Society, Mizrachi Society, The Beth Israel Sisterhood. Editorial in the Jewish Independent’s predecessor, the Jewish Western Bulletin, March 20, 1931. The JI spoke with four friends of the newspaper from longtime Vancouver Jewish community families about the value and future of a Jewish community newspaper: Gary Averbach, Shirley Barnett, Bernie Simpson and Yosef Wosk. We asked each the same four questions and they replied by email. Their responses are printed below. 1. Is it important to have a Jewish community newspaper? If so, what are some of the reasons? It’s difficult to answer this question because it seems so obvious that having a community newspaper is vitally important. 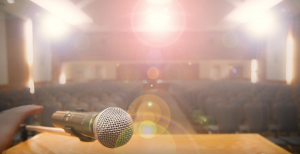 We need a forum and a notice board for opinions and events in the community and, if there was not a publication dedicated to providing that forum and bulletin board, our community would suffer an irreplaceable loss. 2. What do you think the JI/JWB specifically has contributed (contributes) to the community? 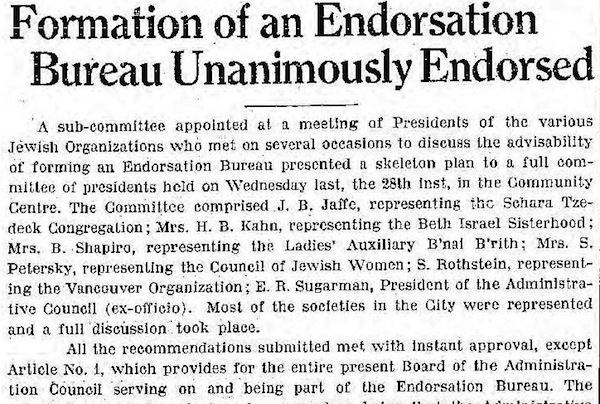 For the most part, the JI/JWB has always been a bulletin board for the Jewish community, informing us about major – and minor – events and happenings. Whether they be reports on events that have occurred in the community – including the greater Canadian and worldwide Jewish community – or just informing us of births and deaths, b’nai mitzvahs and weddings, or local upcoming happenings. If not the JI/JWB, where would this come from? 3. In what ways, if any, is having a print version of value, versus only having an online publication? 4. Do you think that a Jewish community paper will be relevant for your grandkids’ kids? I don’t even know what my grandchildren will be using to access their news in 10 years’ time, never mind what my great-grandchildren will prefer. But I’m fairly certain it won’t be print media as we now understand it. However, that in no way diminishes the need for a community forum and bulletin board giving a Jewish viewpoint on matters of local, national and international events – specifically items that directly involve Jews and, of course, Israel. So, whether it’s an online version, as we now know it, or some further refinement that we can barely imagine now, there will still be a need to inform our local Jewish community by the JI or some similar outlet. Among Shirley Barnett’s many community involvements is helping Vietnamese refugees come to Vancouver. This article is from June 1984. Yes, for sure. I would like more reporting of issues in the community rather than just of events. Exactly that – a sense of community and interaction. For me, for sure. I like to read it over a morning coffee, and still cut and clip. It is extremely important for the Jewish community, which is spread throughout the province, particularly the Lower Mainland, to have a Jewish community newspaper. There is no question that the viability of printed media has been affected by easy access to online papers, however, it is noted that just about every ethnic community in British Columbia still has printed media, which is read primarily by the older generation. 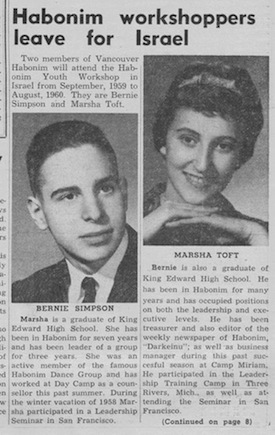 This article from 1959 is but one of many recording Bernie Simpson’s participation in Habonim and other community organizations, including the Jewish Western Bulletin. For example, in the Indo-Canadian community there are at least one dozen papers, half of which are in Punjabi. However, two of the most prominent papers, the Voice and the Link, have been in existence for more than 30 years, and are able to attract substantial advertising and are thriving within the community. The Korean community has at least six papers, primarily in Korean. 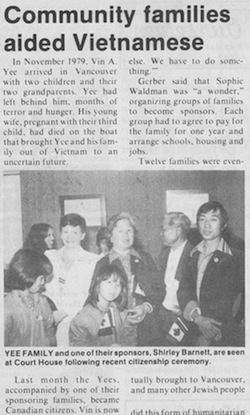 The Vietnamese community has at least four papers. The Chinese community has a countless number of newspapers, which attracts readers from the various regions from where the Chinese community has come, including Taiwan, Mainland China and Hong Kong. Admittedly, however, those communities have far more significant numbers than the Vancouver Jewish community, and that may be the reason why those papers are more economically viable. The Jewish community newspaper, by definition, helps promote a community by giving news as to various events that are happening, not only in Vancouver but in outlying areas. It is also a vehicle to announce important fundraising activities and to give proper recognition to those who are honored in the community. The reporting of international news particularly as it relates to Israel is important, and also the editorial content. I believe that we are fortunate in having editorial content that is objective. The letters to the editor, by and large, are articulate and represent, on occasion, a different view than the mainstream Jewish community may have, particularly with regards to Israel, and this view should be welcomed as it serves as a catalyst for thoughtful thinking on sensitive subjects. The stature of the Jewish community would be diminished considerably in the eyes of the non-Jewish community if there was not a Jewish community paper. There is still the view that the Jewish community is well organized, speaks with one voice on contentious issues, is socially active in liberal causes and even responds to tragedies throughout the world, and I would think that the image of the community will be tarnished considerably if a community paper did not exist. To a certain extent this question is partially answered by my response to Question 1. I believe that this paper helps keep the community focused and together, and it takes into consideration all aspects of the political spectrum as it relates to the three levels of government and objectively reports what is happening in Israel. We are indeed fortunate to have the publisher (working with various editors), who is an outstanding journalist as is evident by the many awards that the Jewish Independent has won. If it would happen in the future that the Jewish Independent did not exist, then that void very well could be filled with a community publication that lacks the objectivity that the present Jewish Independent has. For a brief period of time several years ago, such a paper did exist, and it was quite clear what the agenda of that paper was. In the Jewish Independent’s small way, it does help the debate with regards to the peace process in Israel between the Israelis and the Palestinians and the concept of a two-state solution. I think, at this point, the majority of the readership are still of the generation where they don’t naturally gravitate every day to their computer or their mobile to see what news comes out this week in the Jewish Independent. Longtime members of the community have had ingrained in them that towards the end of the week, the Jewish Independent will arrive. It often stays around the house until the next edition. I would think also that it would be harder to get advertising revenue if you’re only online. Frankly, I’m not terribly concerned about the answer to that question, nor is it really relevant to the present situation. I am a senior member of the Jewish community now; my grandchildren are 6, 3, 2 and 1. It’s impossible for me, who on my best of days has difficulty directing my attention to the immediate past, to focus on whether the paper will be relevant for my grandkids’ kids, which would be around 30 years in the future. I don’t think that we should be too concerned about that question, but what we should be concerned about is how we can make the Jewish Independent more economically viable. One obvious answer is an increase in subscriptions. Perhaps, an active volunteer campaign could be conducted by members of the community to try to sign up more subscribers. This will make it easier to get advertising revenue. It may be that there should be “an advisory board” set up to advise the present publisher as to how to make the paper more attractive to advertisers and to readers. There is a great deal of talent within the Jewish community (well-known reporters who are still active, retired reporters with national papers, etc. ); this is a resource that perhaps should be called upon. Also, an advisory committee of individuals – businesspeople – can lend help financially, if the situation arises. 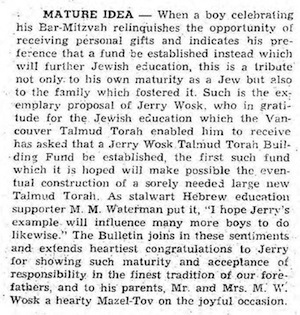 Yosef (“Jerry”) Wosk’s decision to donate funds to Vancouver Talmud Torah on the occasion of his bar mitzvah in 1962 drew the attention of editor Sam Kaplan. Yes, I feel it is important to have a community newspaper. It helps to gather and focus information about the extended family that is the community. It covers diverse topics, such as social events, politics, education, births and deaths, special interest groups, as well as emotional and intellectual concerns. The newspaper has tried to be a neutral newsgathering and dissemination site. It carries articles that represent the full spectrum of the community, thereby fostering information and conversation. The value of a print edition is that it can be read on Shabbat, it is easily accessible to everyone, including technophobes. It is always open and easy to read. Articles can be cut out and distributed. Having a hard copy on your desk or table gives it an immediate physical presence and material voice. In addition, a newspaper or magazine laying around in a public common area or even in a private home will attract readers who may not open an electronic device and search for a particular media address. The electronic edition may provide a number of supplementary links and also be available through a quick search, but it does not negate the value of a printed edition. Who knows? However, newsgathering and dissemination in one form or another has always been of interest to the human condition and, so, I project that a community newspaper will still maintain its value in the future. It is with warm memories and appreciation that I reflect on the opportunity I had from 1970 through 1985 to serve, at different times, as the Jewish Western Bulletin’s editorial assistant, city-desk editor and assistant editor – all the while helping report on the world’s ongoing number-one story: the Middle-East situation … and the Jewish people, their survival, culture, religion and history. The Greater Vancouver and B.C. Jewish communities were growing rapidly during those years and its diverse members – with, at that time, no internet, email or 24-hour all-news TV channels – primarily looked to the paper as a key source of information for major local, national and international Jewish issues and stories. Bringing those stories to Bulletin readers during those pre-computer days, with its absence of word-processing and page-layout software, was often a very arduous endeavor, with copy that had to be typewriter-written and then often retyped, and pages that could only be slowly hand-designed. Additionally, the then standard usage of large linotype printing machines (running in the back of the Bulletin offices, and operated by four persons) resulted in a much longer and more involved production process than the one found today, where late-breaking stories can be readily included using digital technology. 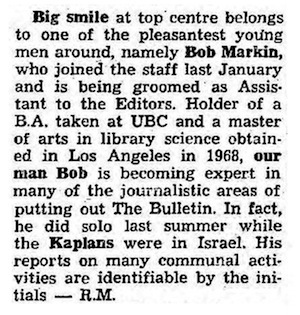 Description of Bob Markin, JWB, 1970. Guiding the paper with excellence were the exceptionally dedicated and talented publishers and senior editors, Sam and Mona Kaplan. One goal was prevalent in all of the JWB’s undertakings during those years: to extensively and objectively cover important news and issues that affected the well-being and life of the Jewish people; to serve and advance, as best as possible, the B.C. and Canadian Jewish community, its individuals and organizations and, of course, Israel and world Jewry. In serving the community, the Bulletin often focused on supporting Zionism, alerting the readership to antisemitic threats and incidents, and reporting on immigration issues. Readers could regularly find wide coverage of local community events and organization happenings, feature articles on community issues, in-depth profiles of local personalities and leaders, etc…. and the Lazar (Between Ourselves) column, with its breezy, informal style of “breaking” community news-gossip, was usually a must-read for JWB readers. The culture scenes were far from neglected, with reporting by theatre, art, music and, yes, Jewish stamps, columnists and reviewers. The full-range of lifecycle milestones, such as births, b’nai mitzvahs, engagements, weddings and obituary announcements, were regularly printed. Jewish news from across Canada and worldwide was extensively covered, with emphasis, of course, on the ever-changing situation in Israel and the Middle East, as well as the special plights at that time facing Soviet Jews and Ethiopian Jewry. Throughout my 16 years at the paper, I found that participating in each issue’s production was truly an ongoing highlight, resulting in a strong feeling of exhilaration as the approaching deadlines brought with them an intensity in office visitors, copy submissions, planning, writing and editing, phone calls, the sounds of typesetting, etc. Other memorable times included the privilege of meeting visiting and local VIPs for stories and feature profiles, and taking part in a special Jewish Agency-sponsored tour of Israel for North American Jewish journalists, during which participants met many key leaders. The staff always came through. When heavy snows closed offices around the city, we were at the JWB ensuring that the paper got out. When postal strikes thwarted distribution, we made arrangements for copies to be picked up, free of charge, at key community locations. And when large holiday editions saw production-time pressure, the typesetters would work all night to make sure that the paper would be in readers’ hands on time. The Bulletin always respected the challenge of objectively and completely reporting on the full spectrum of what was happening in the Jewish world. It was very interesting, challenging work and an utmost privilege and pleasure to work with this wonderful community. 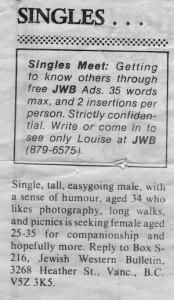 A singles ad placed in the Bulletin by father-son team Ron and Steve Freedman in 1992 led to the engagement (in 1997) of their son/brother David to Betty-Mae Coblenz, who were married in 1998. 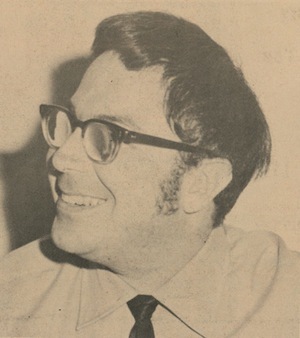 Ron Freedman, who passed away in December 2014, worked for the Jewish Western Bulletin / Jewish Independent for 46 years. As we mourned his loss with his family at a ceremony celebrating his life, his son David shared the story of how his father and his brother Steve, who has worked at the paper for more than 30 years, used the power of community media to change his life. “David Freedman was baffled. Three young women had responded to his personals column ad in the Jewish Western Bulletin. But wait! He had never placed an ad. But whatta ya’ gonna do? His curiosity was aroused. So he agreed to meet Betty-Mae Coblenz for coffee. They talked for hours. Not long ago, Betty-Mae Coblenz became Betty-Mae Freedman.